York City will be taking over the deed for Penn Market in an effort to help the struggling market make necessary capital improvements, according to Shilvosky Buffaloe. York City will be taking over the deed for Penn Market, likely by the end of the year, in an effort to help the struggling market make necessary capital improvements, according to Shilvosky Buffaloe, the city's interim economic and community development director. "The market's 150 years old — it needs improvements to be around for another 150 years," he said. York City's Redevelopment Authority and the board that owns the market are entering into a "memorandum of agreement" that will involve the transfer of the deed for the west end property to the RDA. After that's done, Buffaloe said, the RDA will hire a firm to undertake an assessment of the big old building at the corner of Penn and West Market streets. When they get the results, hopefully by the end of 2017, the RDA will seek grants and awards to pay for the improvements, he said, and then work will begin in 2018. "We anecdotally know that it needs new windows and that it needs new doors," he said, as well as fire-suppression systems, plumbing, bathrooms and exterior work on the brick. Buffaloe said the RDA has the ability to get funds that the market otherwise would have no chance for — that's why this will help, he said. After the work is done, the RDA will transfer the deed back to the board that runs the market. 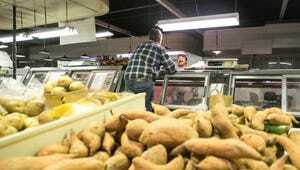 Penn Market is open Tuesday, Friday and Saturday, with several vendors selling fresh produce, meat and prepared food. But many of the booths remain empty in the market, which has faded over the decades. Bob Wood and Karen Ruffini, who had been vendors in the market until they left recently, were not pleased with the developments. Wood, who attended one of the RDA's meetings recently, spoke out against the idea, saying it institutionalized the current ownership, which he has issues with. "They kept board members in the dark," Wood said of the Ilyes family, which is influential at the market. "The Ilyeses have dropped the ball." Jimmy Ilyes, the manager of Penn Market, didn't respond to a message Wednesday afternoon seeking comment. Buffaloe dismissed Wood's complaints, saying that the market, as a private institution, could run itself however it wanted, and if vendors didn't like it, they should go somewhere else. "The city has no control over operation, nor do we want it," Buffaloe said, adding that the memorandum will have language to that effect. Buffaloe said York City Mayor Kim Bracey hopes the market can return to the level of bustle it had when she was growing up in the city. "She has kind of a personal affinity for Penn Market," he said. And he agrees. The market could provide a valuable hub for the recently rebranded WeCo — West of Codorus — neighborhood, Buffaloe said. "It presents an opportunity again for an anchor building," he said.